Welcome to pubsigns.co.uk - The web window for Grant Sims Signs. 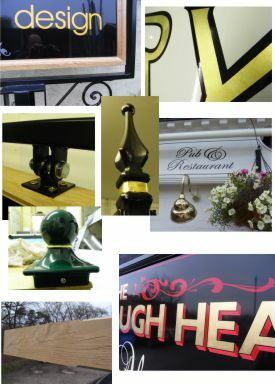 We have been supplying pub signs and services to the licensed trade for many years from our Essex based workshop. Experienced in both traditional and contemporary signwriting by hand, Pictorial mural and commercial artworks from a single handwritten door to a large scale 30sq metre ceiling. Gold, Silver, Copper Aluminium leaf work, Etched gilded and solar film effects to glass, printed digital artwork for pictorial pub hanging signs and interior wallpapers. Hanging pub sign hardware.. aluminium built signs, wall and post mounted forged steel brackets, lighting solutions including the LED revolution. Complete service for wall and post mounted pub signs from artwork design to installation.